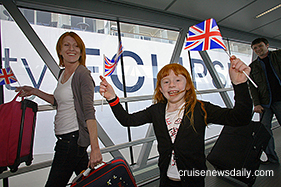 Happy British passengers arrived in Southampton today (upper photo) aboard the new Celebrity Eclipse which delayed its inaugural festivities to transport British and Irish citizens who were stranded abroad when British airports were closed. Celebrity's brand new vessel made a quick trip to Bilbao (Spain) to pick up more than 2,200 (shown in lower photo) passengers on Thursday. 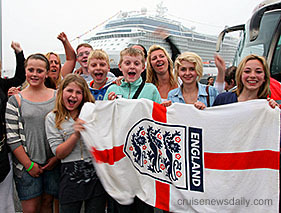 Most were on packaged holidays in Spain and were experiencing the cruise experience for the first time courtesy of Celebrity Cruises. The Coast Guard performed a long-range medevac from Holland America's Amsterdam on Wednesday afternoon (April 21) when the ship was 200 miles south of Kodiak (Alaska) under some very challenging conditions. The Coast Guard received the call from the ship's doctor for assistance getting a 26-year-old man to a shoreside medical facility when the ship was more than 265 miles away from Kodiak, out of range of Coast Guard helicopters. Amsterdam would have to sail north to be within 200 miles of Kodiak, so the Guard waited while the ship positioned itself, and then launched an MH-60 Jayhawk helicopter and an HC-130 Hercules aircraft to assist with communications and provide a self rescue capability to the helicopter crew. When the Coast Guard arrived on the scene about 6:55pm, they found 30 mph winds and snow showers. Nonetheless, they lowered a rescue swimmer to the bow of the cruise ship, hoisted the patient to the helicopter, and retrieved their man on deck within the space of just a few minutes. Fuel, and therefore time, was critical. The video is some of the best the Coast Guard has provided to us. Congratulations to the Coast Guard are in order both for their successful operation and their great videography.